Channeling my Inner Miss Ida ..
Miss Ida was a mean old lady. Growing up in a row home in Baltimore just a stoop hop away from the meanest old lady on College Avenue was no picnic. It seemed the old widow hated children and everything about them, and though it was the early 1970’s, she seemed to have some sort of sophisticated surveillance system that was able to detect a single drip of ice cream on a hot summer day, again launching her from her armchair to the stoop to deliver stern warnings about the “Pissy Ants” we were sure to attract to her pra-per-tee. One thing and seemingly the only thing that did not agitate Miss Ida were the birds. She loved those dang birds. Through the wall I could hear her happily talking to her parakeet…”sing for me pretty boy, pretty boy” ..and it was just so strange. She fed the birds and filled their bath and sang to them in her old hillbilly way…I just didn’t get it…how could someone so mean be so nice..to a bird? Though I have always called myself an animal lover, I guess birds really weren’t included. I considered bird watching an old people thing and would have likely put that on my top ten things to not do when I retire. When my parents started filling their backyard with bird feeders a few years back and keeping binoculars by the window, I’ll admit I was taken aback..how does this happen? 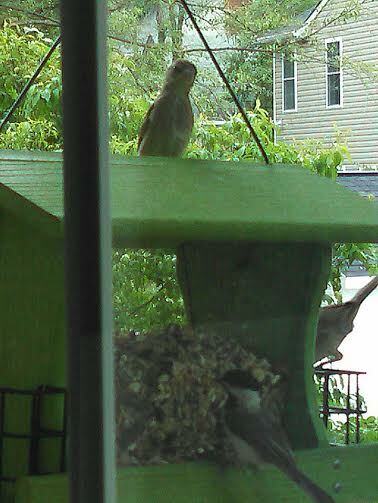 Why do we start noticing the birds more as we age..and for the love of God, why am I suddenly buying three bags of seed a week and contemplating a third feeder? Yep, I am becoming a crazy bird lady…at home and abroad. “Abroad” meaning at my place of employment. It’s a long story, but real quick..our operating room lounge is being renovated and we, along with our microwaves and our coffee pots were relocated to an upper floor. A room with a view..something we are not accustomed to down in the hole. 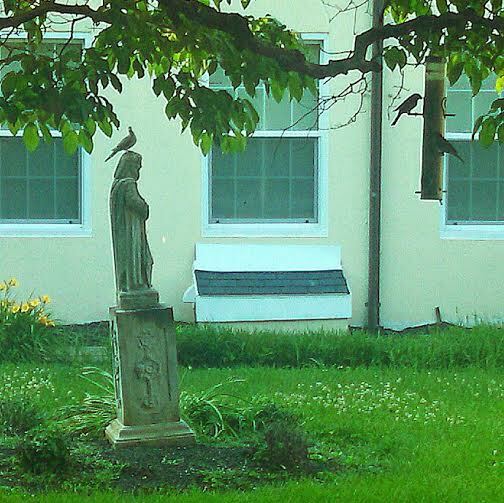 A room that looks out into a courtyard with a very old statue of a Saint whose identity we are still trying to figure out and a beautiful tree with an old, empty bird feeder swinging from it. Well, it used to be empty. Some crazy,old nurse has been filling it daily, throwing a handful of some extra cracked corn on the ground for the doves and tucking some suet up in the tree for the Robins. We are moving back downstairs this week..and I am having visions of me trudging out there in the dead of Winter, becoming one of those work place “characters” that the kids will talk about for years to come. It seems this affection for the birds came on me suddenly..or maybe not. On New Year’s Day 2015, I awoke to what appeared to be a wounded Dove flopping around in my backyard..by the time I rushed back to it with reinforcements (my braver than me husband) the Dove was gone. I pondered messages of peace and hope and generally concluded it was a good thing. I see now that this was meant to be the Year of The Bird for me. I get it Miss Ida..(who really turned out to be just a lonely lady who needed a friend. I remember her crying tears of happiness when my mother got an idea to surprise her with a birthday cake, and now teenagers, we crossed the threshold to her stoop and sang to her. She said no one had ever given her a birthday party her entire life. ) like me, you found your oasis in the birds. In the morning I have my first cup of coffee with Edna and Walter, my Doves., delighting in their chicken-y struts and laid back style, while the Jays and Cardinals and Sparrows and Finches flutter from feeder to feeder ..time to step up on Locust Drive since most of my old lady neighbors are filling bird feeders in heaven these days..guess it’s my turn to jump in Miss Ida’s galoshes. I won’t be planting any child eating sticker bushes, but I am getting a reputation as the neighborhood trash can police..baby steps. This entry was posted in Uncategorized by Tess Wynn. Bookmark the permalink. Good to hear from you again. Nice entry. Good writing Miss Tess [as you step into Miss Ida’s galoshes]. You have made my morning by evoking similar childhood experiences with a mean old widow who terrorized our block. Our scary widow was Italian and wore a kerchief. You painted quite a picture – and I love her vulnerable side with the birds. Enjoy your Year of the Bird – hope it lasts longer than a year. So enjoy how your humor is infused in all your writing. Very special posting. Goodbye Miss Ida and hello Tessie. This is priceless! haha Mom! I am going to need some housecoats and a goatee..bless her soul. Oh Lord, I forgot about Ida’s goatee!